At times you come across a real unexpected gem in the most unlikely of places. Between Murray Town and to Port Germein in the Souther Flinders Ranges we came across Blesings Garden Wines that had a Cellar door and Devonshire tea. With stunning views of the surrounding area, we were greeted by Margo, David and their lovely dog Papillion. The scones were some of the best, home baked and just perfect, served with the most delicious fresh cream and a selection of locally handmade jams, and tea – divine! 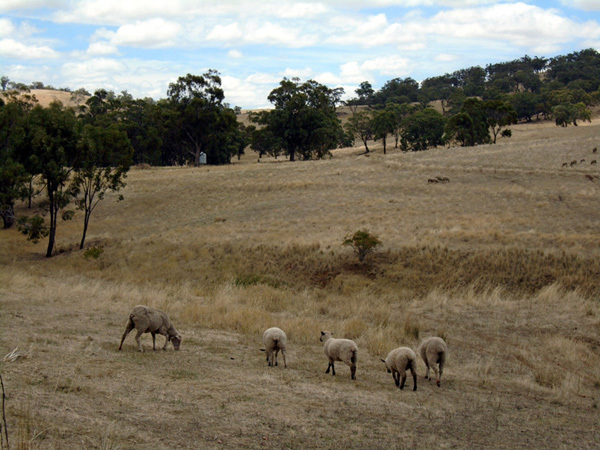 It was just a perfect afternoon in the countryside, and an incredibly all-around Australian experience. David played some subtle classical piano in the background, while the native birds added some music of their own; the sheep grazed contently on the endless golden fields that where the odd Eucalyptus trees swayed in the wind and filled the air with their fresh scent. Margo & David also joined us for a chat, and we felt so relaxed and at home, as though we were spending an afternoon with friends on the patio enjoying their hospitality. The place has a real charm and is full of stories and history, a definite place to stop in at if you are at all in the Flinders Ranges or looking for an excuse to go for a drive in the countryside. We've take note of the this gem, as it's definitely a place to go back to spend a lazy afternoon, taste some wine with friends (this lovely local boutique Flinders brand has a selection of awards), and pass the time enjoying a piece of the 'Real Australia' in it's; scenery, charm, hospitality, wine, culture and history.